At New York City’s Boqueria, chef Seamus Mullen creates exceptional tapas and small plates. F&W simplifies and supersizes his best recipes. 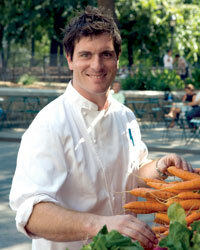 Chef Way Seamus Mullen slowly poaches chicken in a broth made with chicken stock, white wine and vegetables. He tosses the meat with salad greens, fingerling potatoes, carrot ribbons and Spanish Arbequina olives, which can be hard to find. Easy Way Roast the chicken in the oven instead of poaching it, and combine it with red-skinned potatoes and ubiquitous kalamata olives. Chef Way Mullen cooks the rice for this chicken-and-seafood paella as if it were risotto, adding chicken stock gradually. Easy Way Stir stock or canned chicken broth into the rice all at once and cook. Chef Way Mullen marinates leg-of-lamb pieces in a mix of more than 10 ingredients (including saffron and Spanish paprika), many of which he also uses to make the accompanying salsa verde. Easy Way Save a step and marinate the lamb in a bit of the salsa verde. Chef Way Mullen’s gooey Spanish version of a grilled cheese contains Mahón, Manchego and Idiazábal, as well as tomatoes that are roasted slowly overnight. Easy Way Opt for more accessible cheeses and quick-cook the tomatoes in high heat. Chef Way At Boqueria, this seafood dish is made with hard-to-find jumbo diver scallops and extra-large cockles. Easy Way Replicate these flavors with easier-to-find ingredients, such as sea scallops and littleneck clams.